IADC recently released its semi-annual report on international regulations that affect offshore drilling activities. 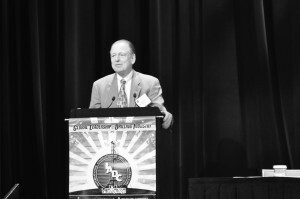 Alan Spackman, IADC vice president – offshore division, is the author of the publication. “It’s important that offshore drillers have access to information that affects their operations. This report pulls together regulations from all sources into one easy-to-access location, and is a valuable resource for our members,” noted Mr Spackman. The latest report, which covers November 2012 through March 2013, includes updates from the International Marine Organization (IMO), International Association of Oil and Gas Producers, the International Seabed Authority and the International Standards Organization (ISO), among others. • IMO finalization of regulations and a code on occupational noise onboard ships; guidelines on recovery of persons from the water and revised guideline for operational implementation of the ISM Code. For more information on the report, please contact Mr Spackman at ext. 207 (Alan.Spackman@iadc.org). On 5 April, more than 18 months after the close of the public comment period, BSEE released the much anticipated SEMS II Final Rule. In response to comments received, both from IADC and IADC-member companies, there were significant changes made to the original draft regulations. Among the areas revised for the Final Rule are Job Safety Analysis (JSA), audit requirements, Ultimate Work Authority (UWA), Stop Work Authority (SWA), Employee Participation Program (EPP) and reporting of unsafe conditions. There are uncertainties regarding how the provisions of the rule will be implemented. IADC will continue its work to obtain clarification from BSEE and the US Coast Guard. For more information, please contact Julia Swindle at ext. 220 (Julia.Swindle@iadc.org). Click here to access the Federal Register’s website for the SEMS II Final Rule and explanation of changes. The IADC Environmental Conference and Exhibition, held on 8-9 April in New York City, featured a lineup of industry veterans who reiterated industry’s commitment to the environment. A theme running through each of the presentations and panel discussions was industry’s interest in meeting and exceeding regulations, with an eye towards the future. Jay Hakes, director of the Jimmy Carter Library and Museum discussed historical events from Santa Barbara to Macondo. He also pointed out the critical need to drill responsibly because drilling everywhere isn’t possible and, as equally, drilling nowhere is also not possible. He noted that the US has reduced imports from 60% in 2005, to within the 40th percentile now in 2013. William K Reilly discusses the implications of energy efficiencies and shale development. Dan Whittle, Cuba Program Director with the Environmental Defense Fund, Rick McCurdy with Chesapeake Energy Corporation, Lee Hunt, IADC president emeritus, Erik Milito of API and Heather Null of Transocean Offshore Drilling Inc, also spoke on various topics regarding environmental stewardship. Elizabeth “Libby” Cheney, global vice president of environment, health, safety, and social responsibility for Hess Corporation and Alby Modiano, president, United States Oil and Gas Association gave keynote presentations. API announced on 1 April the publication of two new oil and natural gas industry standards for well design and drilling operations. • Appropriate barrier and load case consideration to maintain well control. • Guidance supplementing API 65-2 on barrier philosophy and management of API 90 on annular pressure buildup. • Risk assessment and mitigation practices for casing and equipment installation operations. The second, Protocol for Verification and Validation of High-Pressure High-Temperature Equipment, API Technical Report 1PER15K-1, establishes a process or evaluating equipment used in high-pressure and/or high-temperature (HPHT) environments both on and offshore. This new standard provides industry with a consistent approach for designing up-to-date drilling and completion equipment that is fit-for-service in deeper HPHT wells. For more information, please contact Alan Spackman at ext. 207 (Alan.Spackman@iadc.org). Click the link to access the standards at the API website. Recently, the USCG revised their Form CG-2692 (Report of Marine Incident, Injury or Death) and Form CG-2692B (Report of Required Chemical Drug and Alcohol Testing Following a Serious Marine Incident). These new forms do not include substantial changes from the previous versions, which can still be used. However, the USCG recommends using these new forms, which were retitled and placed in a more user friendly, electronic format (PDF), thus allowing “fill-ins” and electronic delivery. Additionally, IADC has a matrix available for MODUs to use to determine if and when submission of these forms is required. For more information, please contact John Pertgen at ext. 203 (John.Pertgen@iadc.org). Click the link to access the new electronic forms via the USCG website. Click the link to access the IADC MODU matrix. On 4 April, IADC issued a letter to Illinois State Representative John Bradley regarding the proposed Amendment No. 3 to House Bill 2615, the Illinois Hydraulic Fracturing Regulatory Act. The letter to the Illinois Democrat highlighted specific concerns, expressed by IADC members, on the proposed legislation. 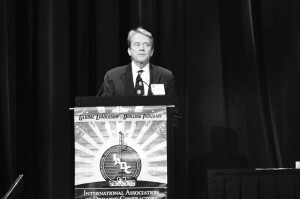 Steve Kropla, IADC group vice president – operational integrity, pointed out that the provisions of the subject amendment to the bill stand to compromise the safety of oil and gas drilling operations in the State of Illinois. Secondarily, the letter noted that such regulations could decrease the attractiveness for investment by operating companies and the willingness of experienced drilling companies to operate in the state. For more information, please contact Steve Kropla at ext. 211 (Steve.Kropla@iadc.org). The US Environmental Protection Agency recently reissued the National Pollutant Discharge Elimination System (NPDES) Vessel General Permit (VGP), which authorizes discharges incidental to normal vessel operation for non-military and non-recreational vessels that are greater than or equal to 79 feet in length when operating as a means of transportation within the three-mile territorial seas of the US. This final permit issuance of the revised VGP, which will replace the one issued in December 2008, imposes a few more requirements such as: prescriptives technology-based effluent limitations for oil-to-sea interfaces, and numeric technology-based effluent limitations that are applicable to vessels with ballast water tanks, has an effective date of 19 December 2013. Those vessels, including MODUs, seeking to renew or obtain coverage, must submit a notice of intent at least 30 days prior to obtaining/renewing coverage. An IADC work group provided guidelines for MODUs subject to the VGP in 2009 and plans to update that guidance publication, which is available on IADC’s website. For additional information, please contact John Pertgen at ext. 203 (John.Pertgen@iadc.org). Click the link to access the IADC guidelines for MODUs subject to the VGP. The IADC Well Servicing Committee, formed in 2008, continues to grow in the number of members and its scope of work. During its 13 February meeting, several new members joined the conversation and contributed feedback to ongoing issues. Specifically discussed was the creation of an incident statistics reporting system for the well services community. Although similar to the current IADC administered ISP program for drilling, the Well Servicing ISP will be tailored to the well servicing industry and will form the first voluntary database collection of such information. The data collected in the Well Servicing ISP will be used for benchmarking and comparison on a global basis. Participation is completely voluntary and company names will not be shared. In addition to the Well Servicing ISP, the committee decided to move forward with the first IADC Well Services workshop. The workshop is being organized by the committee with regards to topics that are relevant to the well servicing industry. The Well Services workshop will take place on 30 October 2013 at National Oilwell Varco’s offices in Houston. Savanna: 605 (1), 642 (1), 643 (1), 645(1), 649 (1), 650 (1), Rig 417 (1), Rig 439 (1), WS 47 (1), WS 103 (1), WS 105 (1),WS 108 (1). Tulsa Drilling Company, LLC, Tulsa, Oklahoma. To change/cancel a Drill Bits subscription, send an e-mail message to IADC Director – Membership Sharon Thorpe at sharon.thorpe@iadc.org.